(2011 Rare Pairings Contest) (2011 March/April Fic Trade) Quick Fang offers Foxtail a place to rest. 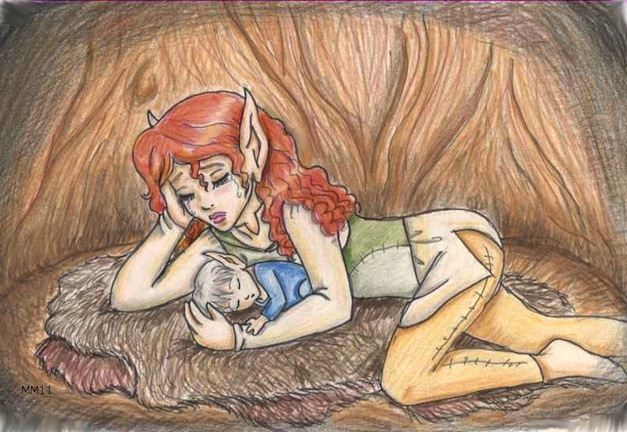 She peered through the doorway to her pare� to her father�s den and watched closely as Quick Fang nursed her brother. As soon as Rill�s mother finished, Foxtail would take him back. After all, he was her brother, and therefore her responsibility now. Foxtail knew that the whole tribe would help care for and raise little Cinder, but somehow she felt that most of the weight was on her � she had been carrying him when their mother died. In Foxtail�s mind, that bound them together, and gave her more responsibility. She was determined that he would feel loved and accepted and cared for. She was determined that he would not lack for anything that she could provide him. Of course, milk was not something she could provide � thus the need for Quick Fang�s assistance. Foxtail shook her head, stepped through the doorway, and held out her arms. Foxtail nodded and held her brother tightly. He squirmed and shook his chubby little legs and arms. She loosened her hold, and he relaxed. Foxtail waited until she knew Quick Fang was far enough away, then looked around. She couldn�t bring herself to sleep in the bedbowl so recently occupied by both of her parents, so she had set up her own furs in the adjoining gathering area. Relaxing into her makeshift bed, Foxtail lay her brother next to her. He snuggled against her and put one arm over hers. That small gesture, most likely inadvertent and not truly done out of a choice made by such a small baby, grabbed Foxtail�s heart. She squeezed her eyes tightly against the tears that welled, but remembered where she was and let them spill. "Oh, Cinder... I'm so sorry. I'll take care of you, though. You're mine to watch, all right? I promise," she whispered. Moments � or so it seemed � later, Cinder began fidgeting in his sleep, waking Foxtail. She pushed herself up from the furs and quickly changed the moss that surrounded Cinder�s small bottom, pitching the soiled mess toward the bowl kept for such a purpose. She would take it out later. Her brother made a small sound, and she knew he was hungry again. High Ones, was she tired. Remembering Quick Fang�s instructions and invitation, Foxtail wearily picked her brother up. She sent to her father, letting him know what she was doing so he wouldn�t worry, and headed toward her friend�s den. Foxtail smiled with relief. She hadn�t been looking forward to waking her prone-to-biting tribemate. Stepping into the den, she handed her brother over, then made herself comfortable in the bedbowl as well. Foxtail nodded wearily. She refused to sleep until Cinder was cared for and she had accepted that staying near Quick Fang would be best for all of them. Cinder made a happy sound as he nursed. **He hasn�t cried for her,** Foxtail sent. **It�s not the same,** Foxtail protested, wondering why she was confiding this to Quick Fang of all elves. Foxtail had thought of that, but hadn�t wanted to. What would Cinder do, then? Or would he have been� she shuddered at the thought. Better to focus on what was here, now. She didn�t send, lest the dam of emotions burst. Instead, she sighed and leaned back. She was tired. Quick Fang finished nursing, then handed Cinder back to Foxtail. Rill shifted in his sleep, and Quick Fang shushed him quietly. Then, laying into the bedbowl beside Foxtail, Quick Fang put an arm around Foxtail and held her close. Foxtail closed her eyes, and fell asleep.